T&D UK distribute SIBA high voltage fuse links for reliable circuit protection of air, gas and oil insulated high voltage switchgear and transformers operating at 3.3kV, 6.6kV, 11kV, 20kV and 33kV voltages - this includes back-up fuses, general purpose fuses, motor fuses, capacitor fuses, overhead line fuses and full range high voltage fuses for switchgear and transformers. 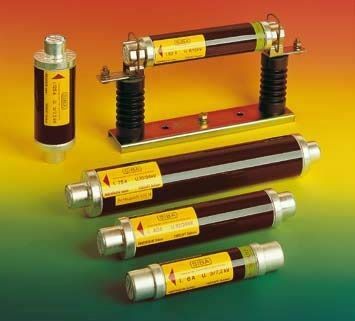 Also - British Standard (BS2692), German DIN Standard, North American Standard and French Standard high voltage fuses. SIBA HV high voltage fuses 11kV are approved for network use by E.ON, Central Networks and Scottish and Southern Energy. T&D stock and distribute an extensive range of High Voltage Cable Terminations, Plugs & Cable Connection Systems up to 33kV for polymeric (XLPE EPR) and paper (PILC) insulated cables - 3M Cold Shrink Terminations, Prysmian Heat Shrink Terminations, SPS Heat Shrink Terminations, Nexans Screened Separable Connectors and Pfisterer Inner Cone Plugs compatible with air and gas insulated switchgear manufactured by ABB, Siemens, Eaton Alstom, Brush, Schneider and Hawker Siddley. Electrical system designers and contractors should be attentive to the short circuit forces generated by high voltage power cables and select cable cleats to provide cable support and containment - Ellis Patents Cable Cleats provide reliable cleating of high voltage cables, 11-33kV.